Someone else named BOB reminded us that Bristol ran a war time Merryweather Dennis Turntable Ladder truck GLW424, so just in case he didn't have a photo of it I thought I'd share one that was given to me a long time ago by a fellow firematics enthusiast. His name was John Hughes, a police officer with the City of Cardiff. John was always ready to share with me and others, and he was the recipient of many of my California fire apparatus slides, so I'm sure that if he was still with us today he would be only too happy to share on this site. There's nothing worse than having albums of great pictures that no one wants to see. This machine is virtually identical to the one I've posted from Scotland. Hello Bob from Bob, i knew John all those years ago, a sadly missed gentleman.This photo was taken at Speedwell fire station but the TL finished her days at Avonmouth, i only managed black and white pics of this vehicle, not nearly as nice as Johns shot.Feel free to e mail me if you want to. Added by Bob on 21 November 2008. Yes, John really was a great man. He and I traded prints and slides for many years. He truly was a sad loss to the fire appliance enthusiast's fraternity. Added by Ian Moore on 21 November 2008.
from John Hughes through many books on fire appliances in my collection. one in presevation...........Worth asking maybe?. Added by Pete Matten on 21 November 2008.
fire equipment, and on into the day of the four-axle Volvo platforms; he must have had hundreds o photos including on scene shots. I'd guess he had some in NFS livery. I have no idea what happened to him, but all of a sudden my letters went unanswered. I'm sure others knew of Bryan, , so maybe we (or rather you guys over there) could find out and see if he's still around or who got his extensive collection. There are several ECUs and Heavy Units at rallies, fairs etc. as you know. Anybody live near West Ealing---something like 10 Hissel Road? Added by Bob Graham on 22 November 2008. What a superb shot of GLW 424 that has been resting quietly in a building for the last 20 plus years but now is looking for a new home as the Fire-Aid International collection is being scattered far and wide. Hopefully Mike Cotton will be able to come up with an answer as the old girl is looking very tired. It's in the same condition as when it arrived in Hampshire from Cornwall in the late 1980s with the ladders partially extended. Unfortunately a gesture to keep another similar appliance operational backfired as the loaned Meadows cylinder head was never returned and the recipients have denied all knowledge. I'm far too trustworthy ... should have got it in writing! This would be an excellent opportunity to get a wartime Dennis TL in grey NFS livery (as mentioned by Pete Matten). I'm sure that Bristol Bob wouldn't mind seeing it in NFS grey rather than in Bristol red. As far as the late great John Hughes is concerned, a true friend and sorely missed by everyone who knew him. He was called in far too early by the Chief Officer. Added by Simon Rowley on 19 February 2011. I do not think she was grey during the war. Added by Bristol Bob on 19 February 2011. Is Bob Graham the same one as A.D.O.Graham, Worcester City & County Fire Brigade/Hereford & Worcester?? Apologies if barking up the wrong tree.! Added by Andy Holtham. on 20 February 2011. Added by Bristol Bob on 20 February 2011. Yes Bob is a American, I traded photos with him in the 60s. Also I have seen Bryan Edwards at local toy fairs, as he collects 1/87 models. Added by Ian Scott on 20 February 2011. Thank-you Bob for conceding that 'grey will do' and hopefully, when she reaches her 70th birthday next year, she might be 'looking healthy' again. 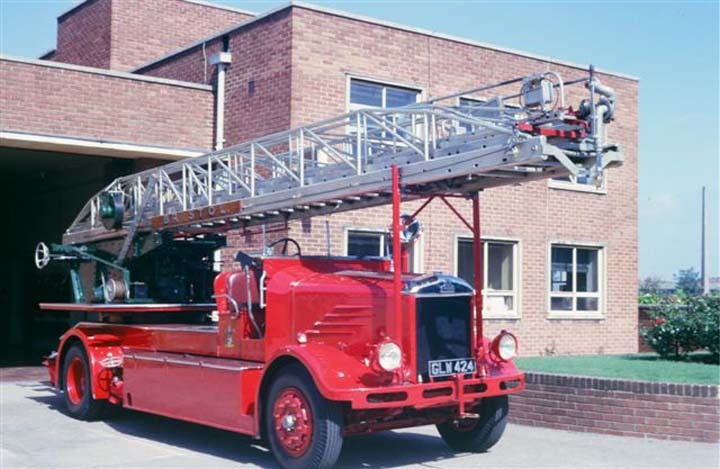 I have spoken to two learned fire historians, Messrs. Mardon and Adamson, who both agree with my original assumption that GLW 424 was delivered to the NFS in grey and was painted red in 1948 when she was acquired by the Bristol Fire Brigade. Added by Simon Rowley on 20 February 2011. Oh all right then Simon, grey it is ! in the early 1960s. It's good to hear this oldtimer is in preservation. Added by Bob Graham on 21 February 2011.